Allegations: On April 15, 1918, at Peterson's store in Moorhead, Burling allegedly said that "if he had $10,000 he would not buy a Liberty Bond because the Liberty Bonds were nothing but a damn graft, and further that no matter what happened he would not eat corn bread." The witness also testified Burling said "it was a rich man's war and let the rich men buy bonds. Not a paying proposition; they wouldn't pay over 40 cents on the dollar for them. Said he wouldn't drink coffee without 2-3 spoonfuls of sugar--I was telling him about being only allowed one spoonful." Case Details: Burling served 9 months in prison and was released on July 13, 1919. Personal Information: Born in Bula, Ill., along with his twin sister, Ella. Arrived in Woodward County, Okla., in 1901 in a covered wagon with his family. Served on the school board 1903-1904. 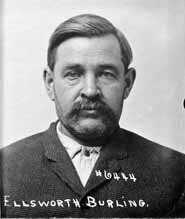 After wife Carrie died in childbirth in 1909, Burling moved to Lamar, Colo., then to Sayle, Mont., where he was a homesteader in Custer County at the time of his arrest. He died on Washington on May 23, 1926, and is buried in Woodward County, Okla., next to Carrie. Relatives in Oklahoma.